This brief treatise was written by a woman who converted from Judaism in the early days of the 20th century and who, in her zeal to convince her fellow Jews of the wisdom of her conversion, wrote much in defense of Our Lord and his Church. One of her most famous works is Why Jews Convert­—the personal story of many Jews of her day who came to the realization that Jesus was the promised Messiah and who, once having accepted that fact, followed him in the Catholic church that he founded. Given here is the barest sketch of the history of the world, followed by extensive quotes from the ancient Hebrew scriptures and a corresponding text from the New Testament proving their fulfillment. She then discusses the questions “What think you of Christ? Whose Son is He?” and gives the proper answers. Finally, she exhorts her past co-religionists to consider her arguments and then gives a list of hundreds of Jewish converts in an appendix to the work. This is a powerful little tool for both education and evangelization. Loreto’s editors think highly enough of it to have brought it back into print after an absence of over 70 years. What Must be Our Conclusions? “I fulfill the pleasant duty of informing you that the Holy Father has gratefully accepted the offering which you have made him of the little volume, The Heavenly Road. “And there shall be one fold and one Shepherd” (Jn. 13:16). In the following pages, the author has told the story of God’s revelation to the human race. With simplicity of faith in the bible as in God’s word, and a mind unclouded by the modern theories of the evolution of religion, due to sociological or other environment, she has clearly grasped and sincerely set forth the unity and growth of true religion. Revelation begins with the human race. It is unscientific to start with the crude animism, totemism, or magic of savage folk; and therefrom to hark back to primitive worship. Savages are a degeneration from culture; their religion is the deterioration of monotheism. There is absolutely no proof that our race began as cave dwellers, who expressed themselves by a neolithic yelp or a troglodytic snarl. It is equally gratuitous and insolent to assume that man’s first religion was more bestial in form than are the degraded cults of degenerates in the wilds of Africa or Australia. The bible story is clear. When God made man, he revealed himself to the new race. Later on, this revelation was added to by messianic messages to the patriarchs Abraham, Isaac, and Jacob. More complete evolution of revealed religion was given to the world through the prophets of Israel and Judah. And “God, who, at sundry times and in divers manners, spoke in times past to the fathers by the prophets, last of all, in these days hath spoken to us by his Son . . .” (Heb. 1:1, 2). 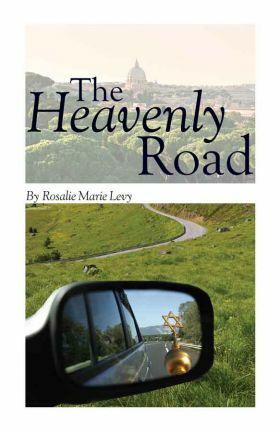 The author hopes that her story will be read with interest by both Catholics and non-Catholics—even by unbelievers. As she is a convert from Judaism, and hopes that open-minded Jews also will be interested in her story, she has taken all Old Testament citations from the Holy Scriptures as published by the Jewish Publication Society, ᴀᴅ 1917. Where this version has seemed not to convey the original text with accuracy, the present writer has translated from the Hebrew. Such literal translations are printed in italics and indicated in footnotes. It is a pleasure to be permitted to contribute a few words of introduction to this fifth edition of The Heavenly Road, especially as I am thus associated with a fellow Jesuit, whose death in 1921 deprived the Church in the United States of an eminent scripture scholar, an unflinching champion of the Faith, and the Society of Jesus of a faithful, zealous religious, Father Walter Drum, S.J., who assisted the writer in her compilation of texts from the Old Testament. During the years that have intervened since the first edition, in 1919, more than twelve thousand copies of the book in English have been distributed. It has won encomiums from distinguished prelates; it has been graciously accepted by our Holy Father, Pope Pius XI; and in God’s Providence it has been the instrument of bringing souls to enter the Catholic Church. This new and revised edition is published in the hope that the book may be helpful to many others who are groping after truth, and lead them to realize that Jesus of Nazareth is truly the Christ, having fulfilled all the prophecies concerning the Messiah, and that the Church he founded is still in the world, carrying on her divine mission, and extending to weary hearts all the graces they need for the perfect service of God here and the attainment of eternal bliss hereafter. Who could fail to be appalled at the large number of Jews in our great cities who are falling away from the religion of their ancestors, many of them becoming atheists, and others joining protestant sects, when the true Church of Christ is at their doors, eager to prove to them that in her the highest aspirations of Israel have been fulfilled on a spiritual plane? May they soon be led within her gates and come to experience the peace and contentment granted to all faithful followers of Jesus Christ! Kohlmann Hall New York, N.Y.